A theory that describes decision-making when risk is perceived. 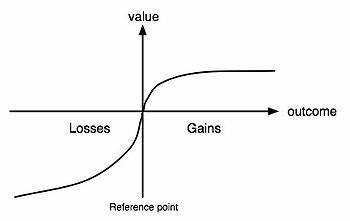 Prospect theory states that people make decisions based on the potential value of losses and gains, rather than the final outcome. A depiction of the heuristics that our brain uses in Prospect theory. The value function that passes through the reference point is s-shaped and asymmetrical - steeper for losses than gains indicating that losses outweigh gains. Further, that in our evaluation, our evaluation of the consequence of losses is greater than the gains. The prospect of losing $100 is more painful than the prospect of winning $100 is pleasant. In general, this could be interpreted as an understanding that the mind is more pain-averse than it is pleasure-attracted. Prospect theory explains the mechanisms behind a number of cognitive biases such as Sunk-cost bias - our unwillingness to let go of things we've invested in. Holding on to an unhappy relationship, because we perceive that letting go means letting go of a huge time & life investment - even though we'd probably be happier alone. Continuing to invest in a business or project which is not succeeding, when we really have no clear hope of it succeeding soon - rather than investing that time and money in a new more plausible project.